1. Price Guarantee is for tyre sales only. 2. We will match any verified price quoted where the tyres are purchased and fitted as one transaction at any Modern Tyres depot. 4	All internet sales are excluded. 5. The Price guarantee is only available at time of purchase. 6. To qualify for Price Guarantee, the tyres must be identical: manufacturer, size, specification, pattern. 7. The quoted tyres must be in stock at the competitors point of sale. 9. 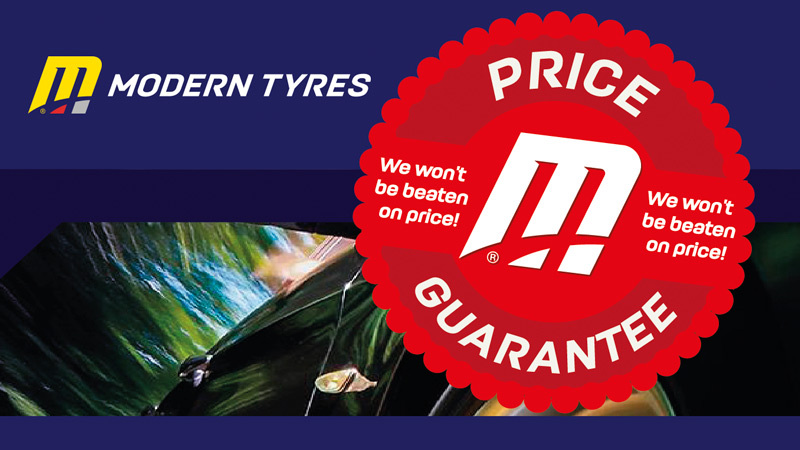 All Price Guarantees will be verified by Modern Tyres Head Office. 11. Modern Tyres reserves the right to amend or withdraw Price Guarantee at any time without prior notice. 12. The Competitors original quote must be presented prior to sale of tyres / fitting.